Life truly begins after you have put your house in order. I am a bit of an everything-in-it’s-place kinda gal. Tidy home, tidy mind and all that. However, I’m not as disciplined with my head. And it appears the idea for the book came from the bestselling book, The Life Changing Magic of Tidying Up by Marie Kondo*. Who knew a book about tidying up could become a best seller but apparently it’s revolutionary. Anyhoo, Sarah Knight realised that it was time to spring clean her life, streamline the mountain of obligations and wave goodbye to unnecessary mental clutter, leaving room for the stuff that really mattered. Hands up if your head has ever felt full. Full to the brim with no room for the good stuff? I’ve been suffering with this of late hence the lack of blog posts. I’ve been feeling like my brain is just too full, consumed with so many other things – some necessary, some probably not – and it’s been hindering my creativity and making me feel generally a bit “meh”. So anything that can help make space for the good stuff, the stuff that “sparks joy”, gets my vote. It’s time to flip the script, reverse the curse, and stop giving all your f**ks to the wrong things for all the wrong reasons. Now this does sound rather harsh on first glance but fundamentally it’s about prioritising and not just saying yes willy-nilly with no thought to how it makes you feel or what, in reality, you’re saying no to in order to say yes. After all, we do only have so much capacity and once we exceed it, we’re left feeling anxious and stressed out. So time to get liberal with our hoots, people! I must admit, I was reading the first chapter open-mouthed wondering how the hell you can achieve it without alienating people and looking like a complete knob! But basically it’s how you tell it. It’s about being politely honest, about agreeing to disagree. It’s about not giving two hoots about what other people may or may not think about your decisions. Easier said than done but worth practising! The book is full of exercises to help de-hoot your life, with the first writing a list of all the things you’re giving a hoot about whether you want to or have to. I’ll be honest, I’ve not been brave enough to open the barn door as I think I may actually get squished as all the hoots tumble out. Pretty sure there’s a lot in there right now that need sorting. My head hurts just thinking about it. But that’s the point apparently. Facing up to what you’re spending your hoots on makes you realise you need to give far less to rid yourself of the overwhelm and make room for the good stuff. The day I stopped giving a f**k about how I looked in a bathing suit, it was like a litter of kittens in black leotards had tumbled down from heaven to perform “All The Single Ladies” for the sole enjoyment of my thighs and belly. Magical! The bulk of the book works through the categories above, giving examples of hoots you may be giving and how to stop giving them. I have to say, the book had me laughing out loud in a few places with some of her personal examples. But really good for making you realise how easy it can be to free yourself of hoots that are holding you back, that are taking up valuable brain space unnecessarily. 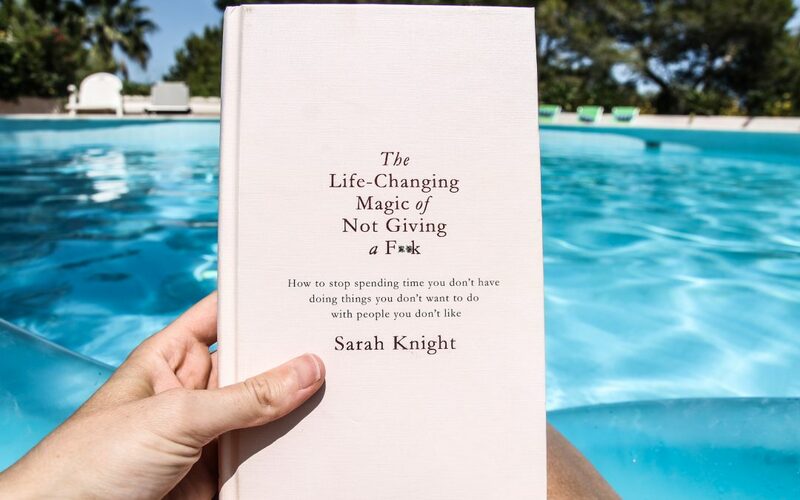 The life-changing magic of not giving a f**k is all about prioritising. Joy over annoy. Choice over obligation. Opinions vs feelings. Sticking to a budget. Eyes on the prize.